She’s a beaut! Here we come Honker Divide. Now there’s just what you need to float down the Rio Beaver with your trusty Coach!! Now there’s the reason for the sawhorses! 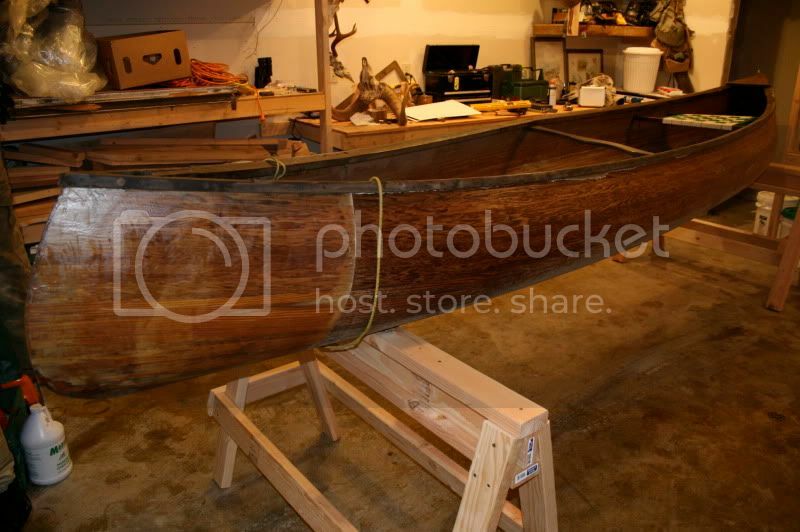 Does the canoe sit well? That is a beautiful piece of craftsmanship. Definitely going to get you around in style. I always imagine finding one at a garage sale one day. Your a lucky duck. Are you going to start posting again? I discovered your site a month ago and I visit every day waiting for an updated story! I keep waiting for a new post too. Trouble is the four kids, puppy, ice free lakes, and steelhead in the river. Gotta prioritize. As a father of three I sympathize about the lack of time. That being said,….That was until I read that you have clear water ways and steelhead. Sounds like posting material if I ever heard some!!!! A thing of beauty! Looking forward to following along the progress!